As someone who's used Divi theme extensively, I can safely say that DIVI theme by Elegant themes is the most powerful, yet easy-to-customize WordPress theme. That's not all, since Divi theme is powered by The DIVI Builder which makes it one of the most advanced WordPress front-end editor and visual page builder. This latest version (DiviV3.0) is lightening faster & has a better user interface than the already good previous versions. But like all other visual builders Divi builder too isn't perfect. Continue reading this unbiased DIVI theme review, to know more. Divi is extremely filled with features be it content modules or the fast loading, instant design changes. Moreover, the split testing feature is something none of the page builders have yet. Divi is extremely affordable. In fact it is the cheapest of all it's close competitors. For $89 you get 69 themes including Divi and all plugins. It has a lifetime plan that saves you of recurring payment unlike any other visual builders. The support is pretty good with pre-sales but it after you buy you get a forum and not the live chat. This is very much made up with highly active Divi user communities and FB groups. When I first purchased a copy of Elegant Themes membership for my Elegant Themes Review, I knew instantly our relationship would grow beyond just the review. One year later today, I power a good couple of my niche sites with DIVI, one of Elegant theme's most powerful and best WordPress blog themes around (one travel niche site runs on their Extra theme, though). It's just because of their fast, intuitive page builder (helps me add videos, call-to-action buttons, portfolio section, pricing tables etc with just drag-and-drop modules). I was doing a bit of competitor research the other day and I was surprised to see most sites ranking for the "DIVI theme review" were just plain superficial reviews of the Divi WordPress theme's versions from the stone age. That's why I decided to come up this updated review (since I already use the theme, it wasn't a lot of work either) that showcases the true potential of DIVI 3.0 (the latest version) that has shown the age of WordPress page builders a new light. This review of Divi theme by Elegant themes isn't a letter of praise from an Elegant Themes fan boy. Since this is an unbiased review, you'll also encounter Divi theme cons that won't usually find a place on other reviews. The aim of sharing this experience is to help you decide (by taking into account the good and the bad) and see if DIVI is the theme for you. If you want to create a custom WordPress website without needing to be a code genius, the Divi theme from Elegant Themes is one of the options I can almost guarantee you’ve come across (in fact - that’s probably why you’re reading this Divi theme review!). Instead of needing those code genius skills, the Divi theme lets you build your WordPress website with simple drag and drag and real-time previews. That ease of use, plus a huge third-party support ecosystem and plenty of unique features, are what make the Divi theme so popular. 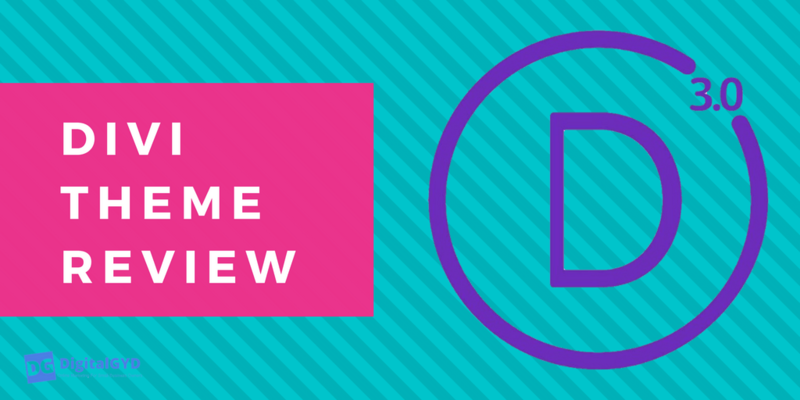 In my Divi theme review, I’ll tell you what I like (and don’t like) about the Divi theme. Then, I’ll give you a hands-on look at how Divi helps you build a beautiful WordPress site. Divi SEO Review: Is Divi Theme SEO Friendly? 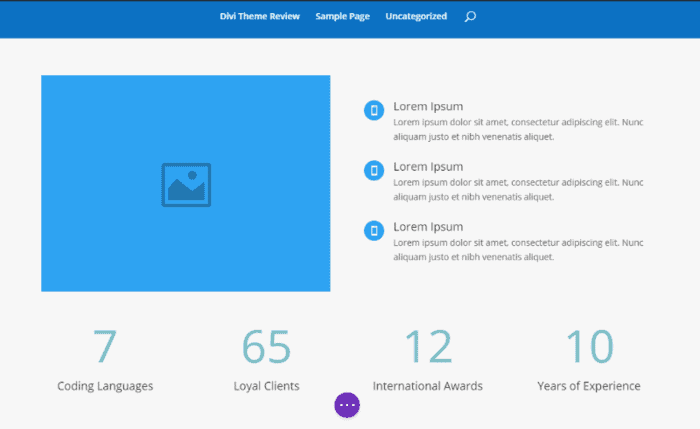 Divi Theme Price Review: How Much Is The Divi Theme? 1. What is Divi theme? 2. How Do I Install Divi? 4. Does All The Modules and Shortcodes Make Divi Slow? 5. Is Divi Worth it? 6. How much is Divi theme? The Divi theme is a multipurpose WordPress theme, which means you can use it to create pretty much any type of website. Watch this mini-video which shows you a brief about what is the Divi theme and all of what Divi 3.0 (alpha) theme can help you do. Divi even supports WooCommerce, though if you’re using WordPress to build an eCommerce store, in case you're selling craft or other physical products on your site. ​Divi also integrates with Etsy if you want to create a Etsy based shop to sell Etsy items on your WordPress blog. 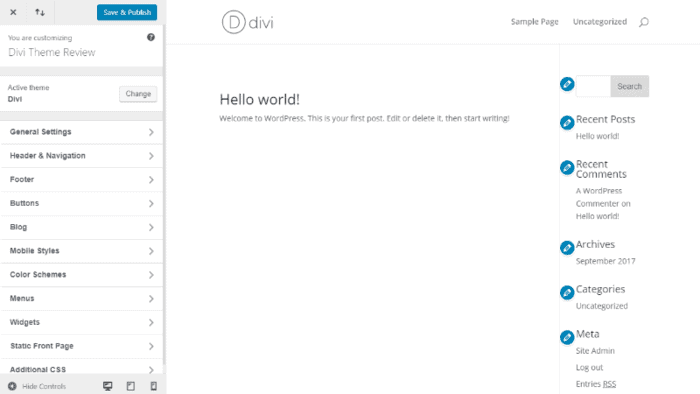 Wondering what actually is the Divi theme and how do you get your hands on one? 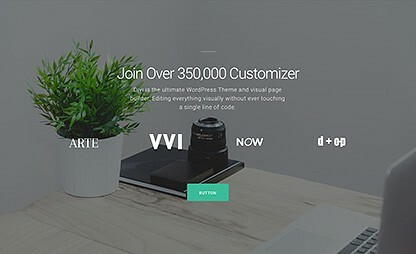 Divi theme is a powerful, multipurpose magazine-styled WordPress theme by Elegant Themes. Divi comes bundled with Divi builder the drag and drop page builder to customize your site as you wish. Divi comes powered with the Divi builder within which enables you to create beautifully designed Divi blog layouts, high converting landing pages, new brandable personal portfolio sites or client sites in minutes. Divi theme is one of the most powerful, yet easy-to-blend with your own needs WordPress theme by Elegant themes. With Divi, you design your websites on the front-end. Write blog posts, add elements like pricing tables, drag & drop over 40 different content modules, customize the text you type, change colors, layouts everything visually in front of your eyes. This is how easy building a homepage/landing page or blog post with Divi is! You don't need to preview after you've completed because everything you did was right in front of your eyes, on the front end of your website! The Base Theme: You use the WordPress customizer and theme options to style core elements of your site like header, sidebar, and generic aesthetic. The DIVI Builder: You use this powerful page builder to design high converting sales pages, add various elements like portfolio section, testimonials, custom buttons, pricing tables etc. all with the Drag-and-drop modules (no code touching!). Thanks to this two-pronged approach, you basically have the power to build your entire website with custom branding without needing to know a single line of code. And that unique selling proposition is what’s made the Divi theme so dang successful. 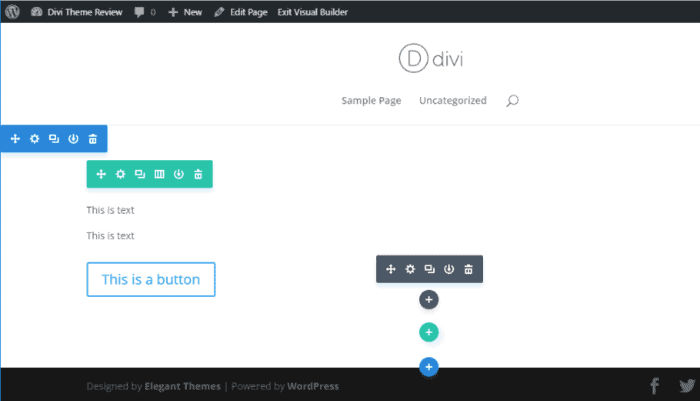 Elegant Themes website claims that Divi powers over 437,821 WordPress websites and this shows how a good theme and powerful features can help you build such a large community of happy users. If you're looking for Divi theme examples or sites build with Divi, here are the top cream of the crop websites that are build with Divi theme. I am sure they will give your creative brains a knack for what you can do with Divi theme and page templates. https://www.abbartjc.com/ This site is a perfect Divi woocommerce example where you can sell your won products. It is literally impossible to list down all the divi theme examples leave alone my personal favorites which range in 100s in numbers. Besides, Elegant themes blog also releases their top sites list based on website niches from time to time like these list of web design sites built with Divi and Divi websites examples for artists & artisans. Ok, now that I’ve given you some general thoughts on the Divi theme, let’s dig in and see how things actually work. I’ll give you a tour of the Divi theme in the order that you’re likely to build your website. That is, I’ll first show you how to style the base theme. Then, I’ll give you a look at the Divi Builder. As I mentioned, the Divi theme uses the native WordPress Customizer to make style changes. 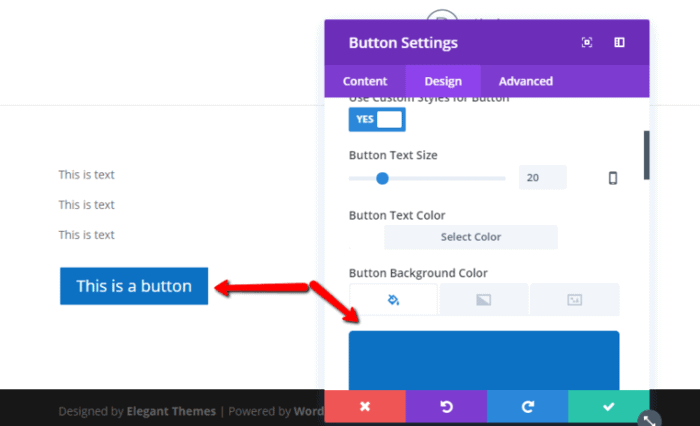 This approach is superior to other themes that rely more on custom theme options panels because it lets you preview all of your changes in real-time. All you need to do is select a new style from the drop-down and you can instantly see the changes reflected on the live preview of your site. I think you get the idea! Basic theme changes are easy to make with Divi and the WordPress Customizer. 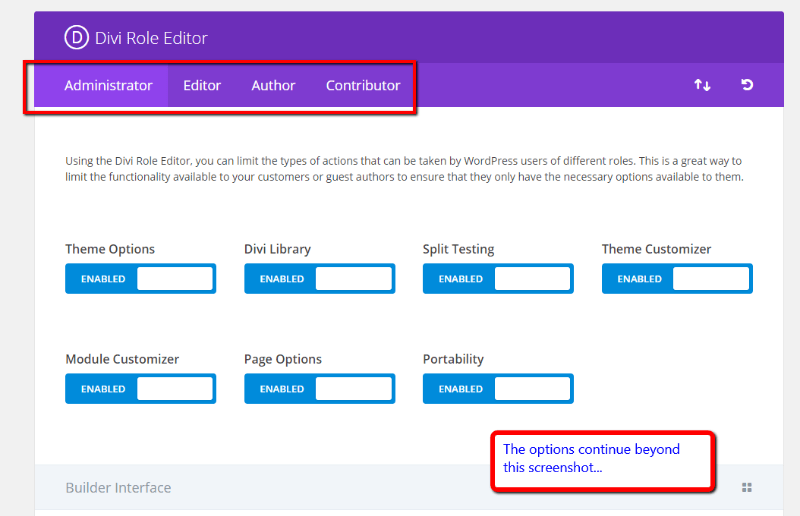 While you can customize many of the front-facing style elements via the WordPress Customizer, Divi does also include a custom theme options panel with even more options. I think some of these options that deal with front-end appearances could’ve also been included in the more user-friendly WordPress Customizer. 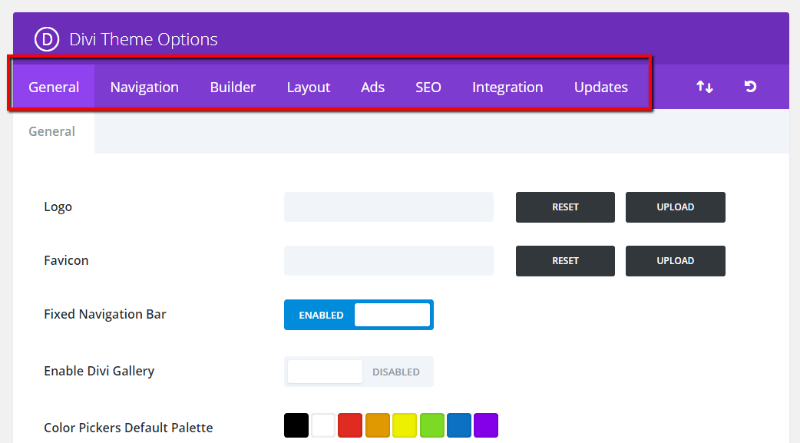 Once you use the WordPress Customizer and Theme Options settings to configure how your base theme looks, you can build the rest of your website using the Divi Builder. 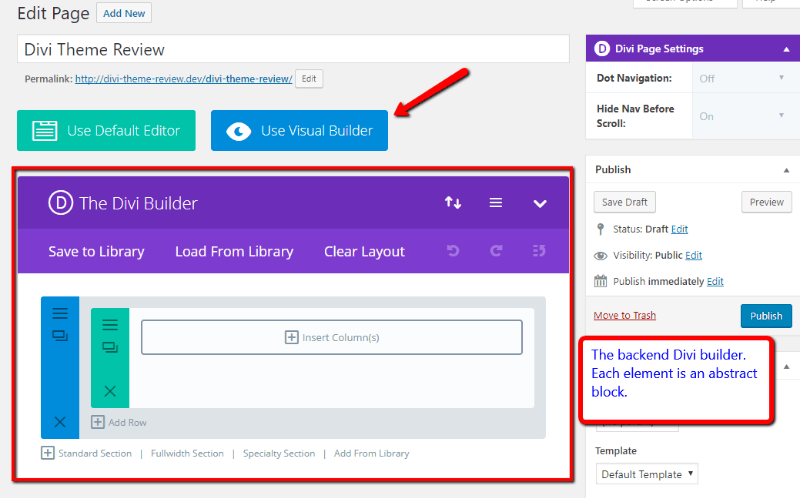 Essentially, you’ll use the Divi Builder to create all of the content that fits inside the “header - footer - sidebar” framework that you choose. Most people prefer using visual builders, so that’s what I’ll show you below. But it is nice that Divi gives you the option to use either. Many page builders only offer one or the other. 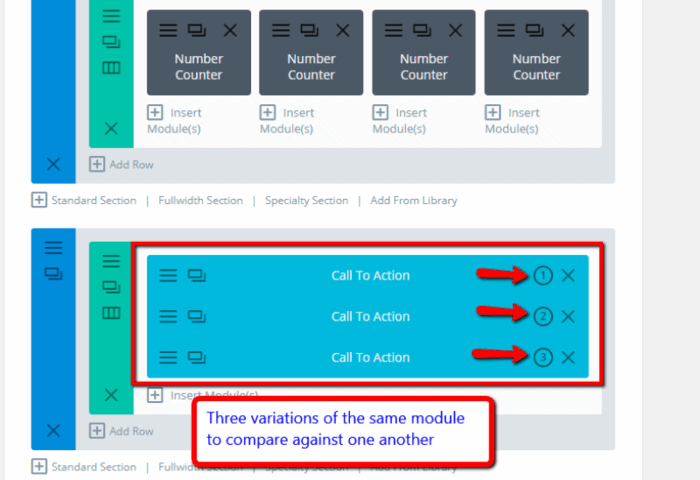 In the Visual Builder, you see a live preview of your site that you can add different sections and “modules” to by clicking the various Plus buttons. In total, the Divi Builder offers over 41 different modules for you to choose from. The Divi Builder is a big part of what sets the Divi theme apart from many of its competitors. While I still think other page builders like Elementor and Thrive Architect are slightly better, the Divi Builder is definitely one of the best page builders out there. Beyond the core features that I outlined above, another thing that puts Divi above the competition is all the extra goodies you get that most other themes don’t offer. In my Divi Builder example above, I showed you how to build a design from scratch. But thanks to the Divi Builder Library, you don’t actually have to do that for all of your pages. All you need to do is add your own images and text and you’re done! You can also save your own layouts to the library to easily reuse them across multiple designs. If you’re interested in improving your site with A/B testing and multivariate testing, Divi’s built-in split testing functionality is an insanely cool feature. Divi 3.0 lets you easily A/B test different design layouts without the need for any complicated or expensive third-party tools. This is one of my absolute favorite Divi features! I haven’t encountered another page builder that makes it so easy to split test your designs. You can also view stats about your split tests to see which variation is performing the best. Yes, Divi theme is 100% SEO friendly. 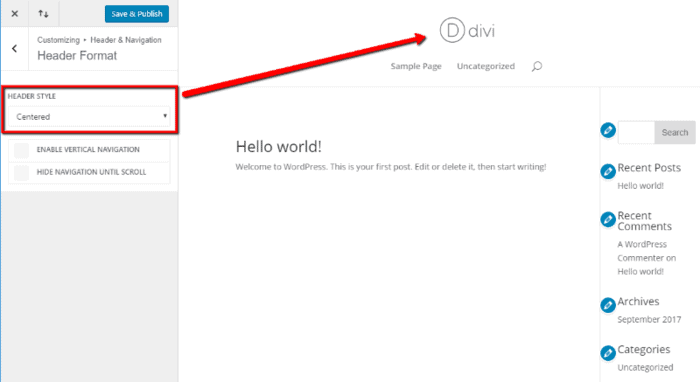 Divi contains all important SEO features a WordPress theme should have plus some more. A few features that make Divi SEO friendly are the presence of schema markup, better site structure, canonical URL feature, and features to add meta titles and descriptions etc. In fact, you wouldn't even need Yoast SEO plugin to add breadcrumbs. In Divi Yoast breadcrumbs can be overridden with the Divi breadcrumbs module which doesn't need Yoast to pull the breadcrumbs data. With Divi, you can have your own breadcrumbs and customize the look of it. (You can of course, choose to use Yoast SEO default settings if you use that previously). 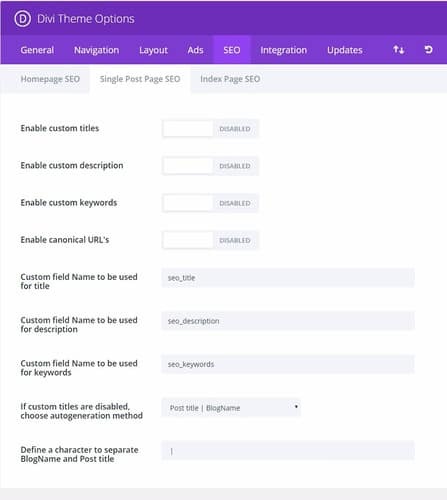 Here is a screenshot that shows you the exact Divi theme SEO settings. Is Divi theme SEO Friendly? Answer: yes! A common question that arises in users' mind is are multipurpose themes optimized to rank higher? I don't know about other themes but I am sure Elegant themes are SEO optimized search-engine friendly. They do have schema markups that let's search engines understand what your business/blog is about and rank better. One thing is sure, Divi uses shortcodes to display your design elements and to style your writing and it does add to the crap of your site's coding structure. However, it is the case with all page builders may that be thrive architect or beaver builder. And search engines are smarter than we think they are. This shortcode junk, as much as it is feared, does not affect rankings in anyway. A cleaner and light-weight theme is good but remember we aren't here to advocate importance of fast loading themes, we are here to make our blog content more engaging and optimized for conversions (sales & subscribers). That's exactly what visual builder themes like Divi help us with. Another helpful Divi feature that you’re unlikely to find in other themes is the Divi Role Editor. Having control over which user gets access to what feature is very essential because you wouldn't like your guest contributors mess up with your posts or someone change something in your already running split testing campaigns. This is a feature I so dang want Thrive themes guys bring up soon. 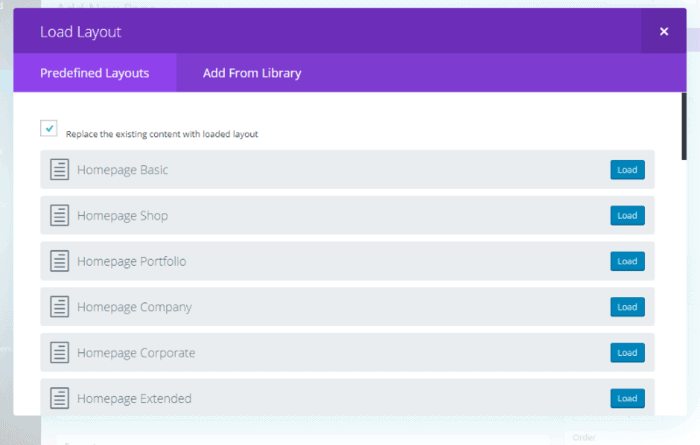 In the Role Editor, you have detailed control over what options each user role on your site can access. There’s a huge third-party ecosystem for support and Divi add-ons. Beyond the Elegant Themes blog, which is an excellent source of Divi information by itself, you can also find tons of third-party Divi tutorial sites. And beyond those tutorials, you can also find a plethora of third-party Divi plugins and add-ons that tack on even more functionality to an already powerful theme. There's a large community of Divi developers doing wonderful things to make the Divi user experience even better. One such plugin is ​the Divi Booster which makes your Divi theme even more faster by minifying the code, more customizable by giving 100s of new configurations and is easier to use. The Divi Builder integrates perfectly into the Divi theme. Divi Builder is one of the best visual page builders out there, so this is a huge benefit. Secured theme coding that is certified by Sucuri. You can create any type of website because Divi is legitimately multipurpose. Because Divi uses the WordPress customizer, you can make changes to how your site looks and see a real-time preview. No annoying page reloads! There are tons of cool extra features like built-in A/B testing, the Divi Role Editor, and more. Lots of third party child themes, plugins, free tutorials, and best of all a huge happy community which is there whenever you need so yes you are not alone. The Divi Builder uses WordPress shortcodes to create its designs. That means if you ever want to stop using the Divi Builder, you’re going to have trouble with your old content. Thankfully, this is less of a problem since Elegant Themes introduced a standalone Divi Builder plugin. With the standalone plugin, you can continue using the Divi Builder even if you change themes, and therefore preserve the design of your old content. ​getting a site designed by a designer for maybe $5000 or $10,000 and then getting locked in that design unless you could afford another designer. Makes sense? Divi theme costs you $89 only for an annual subscription of the theme, divi builder, 86 other pre-built themes and 6 plugins. For unlimited access, Divi theme is $249 paid once which gives you lifetime access to the theme, support and all future updates. In terms of pure value for the money, it’s hard to find anything better than Divi and the Elegant Themes membership. $89 for all of that value is crazy cheap. While we’re big fans of Thrive Themes products here (you may notice that’s what we use), the cheapest that you can get a Thrive Themes membership for is $228. Compared to that, Divi and Elegant Themes is less than half the price. You get access to tons of Divi theme tutorials (one published each day on their blog), free Divi goodies and Divi templates that you can download and use for free. If you have a bit of higher budget I recommend (and use) purchasing the Elegant themes lifetime membership. Because with the lifetime membership, you get unlimited access to all their future updates and themes for just $249 paid once. If you buy the developer license or single Divi theme you pay $89 every year if you want regular updated. So why not pay once and use forever and that too on unlimited sites? Icing on the cake is, you get an exclusive 10 % discount to further reduce the pricing to $224. Wish this, let's wrap the Divi WordPress theme review. The Divi Theme is a powerful multipurpose theme that makes it easy to create a detailed website without needing to know any code. Excellent use of the WordPress Customizer makes it painless to style your base theme, and the Divi Builder helps you create complicated page designs without needing to know how to code. There are some downsides - like shortcode lock-in. But, most users won’t ever experience problems with that, and the introduction of the Divi Builder plugin has done a good deal to mitigate the issue with lock-in. When you consider the excellent overall value offered by the Elegant Themes Membership, I definitely recommend the Divi theme to anyone who wants to build a detailed WordPress site without needing to know how to code. I hope you enjoyed my Divi theme review, and please leave a comment with any questions! As I said, Divi theme is a multipurpose WordPress theme by Elegant themes that can also help you create landing pages, engaging blog posts and even hompage designs with its drag and drop divi builder module. Go to the appearance option on the left column. ​Click on the Add New option. Upload your Divi zip file that you downloaded from the Elegant Themes site and click on install now. Next, don't forget to activate the theme. Voila! you have installed Divi theme on your site. Yes, Divi is responsive in design which means it is adaptive to all screen sizes, in fact, you get to see how each page will look on any device at the moment designing the page itself. Not at all. The modules and shortcodes do not make Divi slow. They barely add to the page weight. Besides, Divi is designed with the best coding structure. The drag and drop modules don't add visible weight to the page loading. Absolutely! Divi theme is worth it. Here's why? In this Divi theme review, we saw how Divi can save a ton of your time in designing beautiful and high converting pages. Not only time, it saves you a lot of money and hassle involved in getting a designer do it for you. With Divi's A/b split testing feature you get to test and know what works. Instead of aiming in the dark, you can optimize your blog for more traffic, subscribers and sales. And considering the price of Divi, I think Divi is no doubt definitely worth every penny invested. Divi theme pricing: Divi theme is $89 per year for unlimited usage. It comes bundled with 86 other WordPress themes and 6 plugins including monarch and bloom. For lifetime usage, Divi membership costs you $224, along with above freebies, for lifetime. If you're anything like me, someone who cannot code, doesn't want to mess up with CSS & HTML but yet wants to create blog posts that woos the reader and convert them into subscribers & sales, Divi 3.0 is for you. Right from drag-and-drop content modules to faster loading time, from creating well designed blog posts to designing high-converting landing pages Divi makes everything a task of breeze. You deserve this blogging luxury and click the button below to check it live! If you're anything like me, someone who cannot code, doesn't want to mess up with CSS & HTML but yet wants to create blog posts that woos the reader and convert them into subscribers & sales, Divi 3.0 is for you. Right from drag-and-drop content modules to faster loading time, from creating well designed blog posts to designing high-converting landing pages Divi makes everything a task of breeze. You deserve this blogging luxury and click the button below to check it live! For me DIVI is a life saver before using DIVI theme i would not have imagined myself making sites. As i’m a newbie and don’t know any coding whatsoever so when i started using DIVI theme i found it really easy and fun also the saving of section, rows, and modules saves a lot of time as you can use those sections, rows, or modules on another pages of the site or you can also export those and use on another site. One Can customize each modules, buttons to their own liking and one can do all these things and much more without coding or going trough any complex steps. 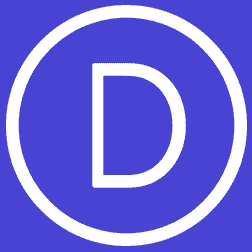 DIVI is really easy and simple. Such a helpful review! I would love to test it, too bad I’m on a blogger. Sometimes I feel really sorry I’m on it because many of people said it’s so much easier for web design. A good theme is so important as the foundation of your site. Thanks for the tips on how to choose one! Your theme seems pretty customizable, which is most important to me as a web designer. Awesome detailed post! Love the research and graphics.Great to know all the features. Thanks! I’m certainly not the best coder when it comes to blogs, nor do I know anything about wordpress (I know I should switch from blogger but its a scary thought) but I was really interested to know about the drag and drop ability, that feels like something I could manage! This sounds like a nice theme. I am amazed at how much details you have gone through about the theme, indeed very helpful. I like Multi-purpose themes and it looks very user-friendly. Being able to modify and then see the results at the same time is the best thing. Since I am new to wordpress and still figuring things out on (only 2 months into the blogging world) I can see how this may come in handy especially for those who are further along in the blogging community to really help make their pages stand out for the rest. This is something I will look into in the future. I am learning for the very first time about the Divi over here and it looks like it has come up with a power packed suit among its class. within a single roof. Split testing is something very handy for me.